This is an improvement run of 5759 frames (in-game time) and 7616 frames (overall) to my my previous 100% TAS. After gaining more experience TASing Sonic Advance 3 (having done two more any% runs of the game after the previous 100% attempt), I decided to put what I learned to the test and redo the 100% run, which was at that time just a "test-run" for my first TASing attempt at Sonic Advance 3. Knowing way more optimisation techniques and alternative routes I managed to cut down the previous run's timing by over two minutes. Optimisations generally just involve better management of the tag actions. In three levels I use a completely different team from my previous run to save considerable in-game time. In certain levels I also use death abuse to go through the various chao much quicker. As with the previous two games in the Advance series, there are 7 "zones" in the game, each with an emerald to collect, by completing additional objectives which are not required to beat the game with an "any%" completion. In Sonic Advance 3, there are 10 chao located in each of the 7 zones, collecting all of which will "unhide" the hidden keys in the individual stages. You must collect the key and complete the act without dying to keep it (will elaborate more on keys later on). Using the key on a special spring in the zone overworld will bring you to a special stage, where you have to collect a certain amount of rings to get the emerald. Sonic and Tails are unlocked from the beginning of the game. To unlock Knuckles, Amy and Cream, you have to beat Sunset Hill Act 3, Toy Kingdom Act 3, and Cyber Track Act 3 respectively with Sonic as the team leader. Cream is never used in this run since the previous two levels in which I used Cream have been obsoleted with a better team, Knuckles/Amy. However it doesn't cost any extra time to collect Cream in comparison with the previous run, as I would've used Sonic/Tails for Cyber Track 3 regardless. This boss can only be accessed after beating the final boss (Altar Emerald) once, then defeating it again with all 7 chaos emeralds in hand. Therefore, it's not possible to skip the "bad ending" first and go straight to the extra boss. Collecting more rings past the required amount on the special stages won't affect time in any way, but I thought that for a movie of this length I might as well optimise everything I can and add on to the entertainment value. Time can be affected in special stages if you jump, and are in mid-air when the "Good!" 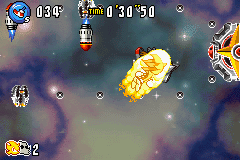 message (which appears midpoint and at the end of the stage) would appear. In which case, the message will be delayed until you land, which ends up wasting time. With these goals, which closely follow those of nitsuja's run (except the death part), more team diversity is encouraged, rather than racing through the entire game with one or two teams simply to avoid resetting and switching characters. The character switching no doubt adds a considerable amount of real time to the movie length, but I felt that better-optimised individual levels would add to the movie's appeal much more than an invisible "real-time". There are between 2 and 4 hidden Chao in every level (or "act"), and sometimes one Chao on the zone overworld. Collecting a Chao brings up a dialogue, which pauses the in-game timer, then the game saves the Chao immediately regardless of whether or not you complete the act. While this technically means I can collect all Chao in one level, then die/reenter again and complete it as fast as possible to "save" in-game time, this would both pile on to the movie length, and kill a whole lot of entertainment with its repetitiveness. As for keys, every level has about 6-8 keys, with half of them appearing in one layout and the other half in another layout. The key layout is random (which means technically there's a 50% chance of any given key appearing in that level), but luck manipulation on my part takes care of that (more on that later too). As mentioned earlier, the layout is determined the moment you start the level, regardless of whether you have collected all 10 Chao in the zone or not. Therefore, the general strategy of this run will be to collect Chao in a certain route on the way to the goal for each level, then collect the 10th Chao together with the key in an act. Before TASing the act in which I would collect the key, I manually collect all the Chao in that act first then see if the key appears where I want it to (typically placed conveniently somewhere between the last Chao and the goal ring). If it doesn't, I add in small delays of 1 frame increments before entering the "Act Ring" in the zone then try again. I have created annotated maps of every level and the zone overworld. You can access the entire album here, or download the pictures here. Alternatively, you can click on the name of the act below to bring up the map. Sonic Advance 3 bosses generally require very tricky optimisation to get perfect timings. For all the bosses (save for Altar Emerald and Nonaggression), after landing the final hit the character's controls will be locked until Eggman flies off the screen. This is why I never end the fight on the right end of the screen, and instead almost always stay at a position where Eggman flies the shortest distance possible off the screen. More information can be found in nitsuja's commentary. I improved the Route 99 boss's ending by doing a better final jump which saved 1 frame of flying (most character actions have a 1-frame cast delay, including Tails' flying). Sunset Hill boss is entirely based on RNG, such that entering the boss map on a different frame with the exact same input will cause a desync somewhere. No changes for Ocean Base boss. I improved the Toy Kingdom boss by facing the goal ring upon the final hit. It involved quite a lot of position tweaking but the final result managed to save a frame of turning around and two extra frames from other optimisations. No changes for Twinkle Snow boss. KirbyMastah showcased an interesting phenomenon where the boss was actually killed offscreen, regaining control of his character much earlier but after fiddling around quite a bit I realised that this could only be caused by killing the boss when it's rushing towards the right; and this can only happen by intentionally letting him do his spiked ball attack to give him invincibility for a few seconds, and it wasn't worth the sacrifice. Timewise there wasn't any changes for the Cyber Track boss either, but I decided to redo it to show off more of Knuckles/Amy's actions to make it look more entertaining, while adding a challenge of not taking any damage during the fight. No changes for Chaos Angel boss and both Altar Emerald fights either. One thing to note is that quite a lot of luck manipulation was needed to manipulate both hands to drop at the earliest possible frame (around the 25-26 in-game seconds mark in both fights) to minimise the invulnerability delay caused when the hands emerge again. Also, if you're wondering why the 2nd Altar Emerald fight is 1 frame slower than the first, it's because Tails/Sonic gets a slight advantage by being able to boost-jump into the boss area 1 frame earlier, while Sonic/Knuckles doesn't. Nonaggression is a really challenging boss and slightly randomised as well. The boss takes 12 hits to kill; and you're supposed to charge up Eggman's tag action to open up the boss's eye to land a hit. It takes 120 frames (2 seconds) to charge it to a minimum level; the longer you charge this tag action, the longer the boss's eye will open upon releasing it. However it is always useless to charge it beyond the minimum amount, since the boss has its own invulnerability frames between hits. You may notice that I deal some hits horizontally and some diagonally. The diagonal hits are typically 2 frames slower than the horizontal ones, but they don't knock Super Sonic back horizontally as much as the horizontal hits. This came in useful once at the beginning where I had to prevent knocking myself back into the ice beam, and a few times during the double rocket launcher phase where I had to avoid the rockets. Ultimately I managed to squeeze out 7 extra frames in this boss fight. Thank you for watching my movie. I'd also love to thank KirbyMastah for his groundbreaking Twinkle Snow 2 discovery (which was primarily the motivation for me to complete the TAS) and Paused too for providing some useful ideas. My thanks too to the TASvideos staff for keeping this site running for so many years and continuing to provide quality content, encouraging me to contribute to the amazing movies I've watched over the years. feos: Accepting as an improvement to  GBA Sonic Advance 3 (USA) "100%" by Dashjump in 1:09:59.42.